Musicians, poets, and a giant chicken: 2012’s first Beacon Rocks! 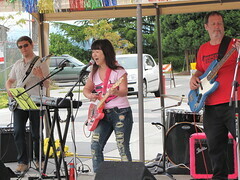 Ichi Bichi performing at last year’s Beacon Rocks! Photo by Wendi Dunlap. The schedule has been announced for the first Beacon Rocks! 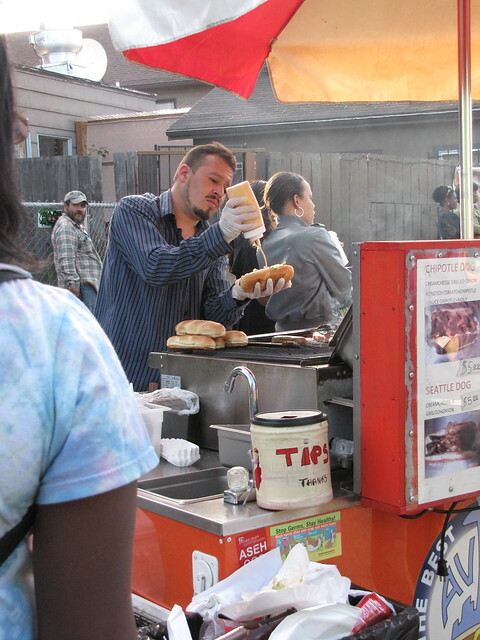 event of 2012 on next Sunday, June 24 from 1-5 p.m. at the Roberto Maestas Festival Street next to Beacon Hill Station. The event’s theme is “Transportation Exploration,” so along with four local bands and four poets, the afternoon will include a “slow bike race,” pedestrian info and walking maps, a visit from Sound Transit with information about the Link light rail system, and a transportation-themed haiku-writing contest with prizes in multiple age categories. We hear there will also be a visit from a giant chicken, to tell us why he crossed the road. Food vendors will be at the site including a taco truck, a crepe truck, and Full Tilt Ice Cream. There will also be info tables on site for several local groups. For more information about this edition of Beacon Rocks!, see the event’s website. For general information about the entire event series, see the main Beacon Rocks! website. Here are a few photos of folks performing, working, and having a good time at the Block Party yesterday on 16th Avenue South in front of The Station. All photos are by Wendi Dunlap. Did you take any photos at the event? We’d love to see them in the Beacon Hill Blog photo pool on Flickr. This is the weekend! 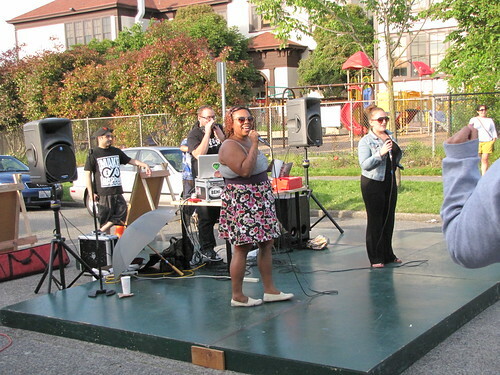 The 2012 Beacon Boogie and Block Party comes to North Beacon Hill from 5-9 tonight and again tomorrow. 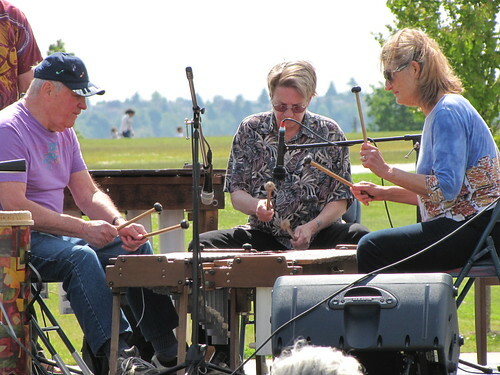 Today, June 9, there will be a series of performances, all within a half-block of Beacon and Hanford: from 5-8 p.m., The Hugh Sutton Trio will be at Bar del Corso, and Dina Blade at Kusina Filipina. From 6-9 p.m., Audio Couture will perform at Victrola Coffee, and Supersones at El Quetzal. On Sunday, the action moves north, closer to the junction of Beacon and 15th, with a musical extravaganza presented outside The Station coffee shop from 4-9 p.m., including Black Stax, Gabriel Teodros, Amos Miller, Otow Gang, and more. (See the poster included with this post.) From 6-9 p.m., the Greg Ruby Trio will play at Travelers Thali House, and from 7-9, Atasha Manila will be at Inay’s. On Sunday there will also be a car show. Admission will be a donation of $5, with no charge for kids 12 and under. The event is sponsored by the Beacon Hill Merchants Association in collaboration with Luis Rodriguez at The Station and other participating merchants. 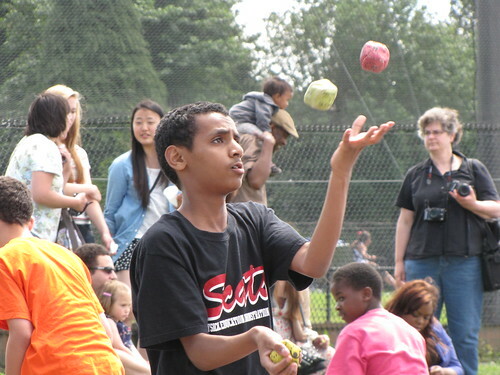 Kids from Seattle Schools Cirque and Acrobat Teams performed for neighbors at the Beacon Hill Festival. The gusty winds caused problems for many of the shelters at the Festival. Here a worker in the Sound Transit booth is holding up the booth's roof after a strong gust. 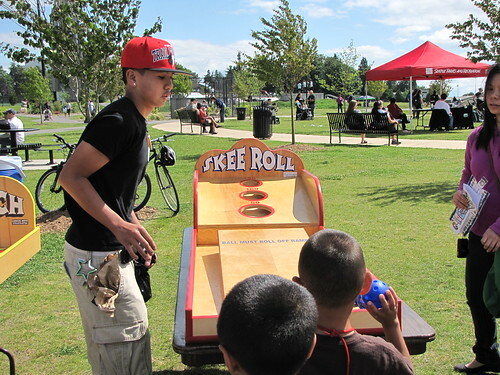 A row of carnival games was set up for the kids. 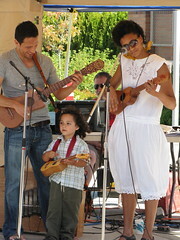 Musical performances entertained neighbors throughout the day. 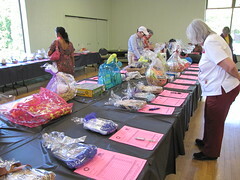 The silent auction at last year's Beacon Hill Festival. Photo by Wendi Dunlap. The 20th Annual Beacon Hill Festival is only a week away! Make plans for next Saturday, June 2 from 11 a.m. until 4 p.m. at Jefferson Community Center, 3801 Beacon Ave S. (You won’t be able to miss it. The event is big!) There will be food, musical performances, bouncy toys, carnival games, vendors, a silent auction, and more. Admission is free for the whole family, and money raised through the vendors and silent auction will go to support scholarships and programs at the community center. Mark your calendar for a weekend of music and food on June 9 and 10, when the 2012 Beacon Boogie and Block Party comes to North Beacon Hill. 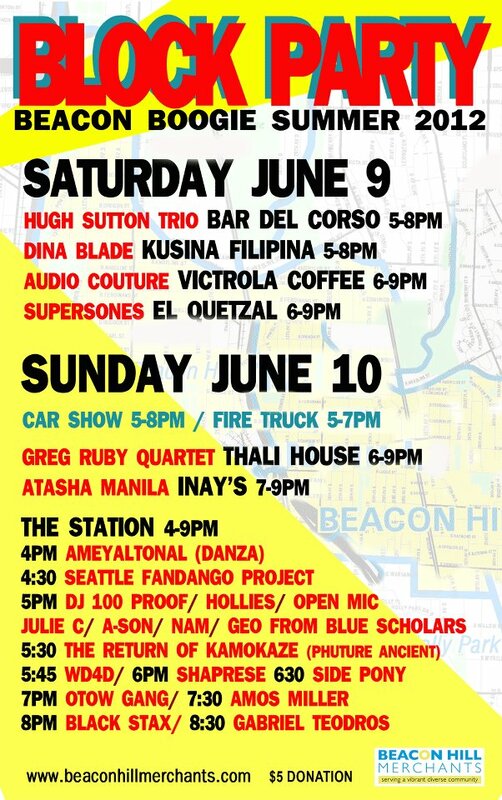 On Saturday, June 9, there will be a series of performances, all within a half-block of Beacon and Hanford: from 5-8 p.m., The Hugh Sutton Trio will be at Bar del Corso, and Dina Blade at Kusina Filipina. 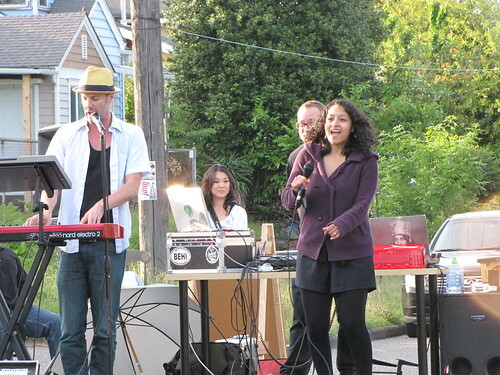 From 6-9 p.m., Audio Couture will perform at Victrola Coffee, and Supersones at El Quetzal. 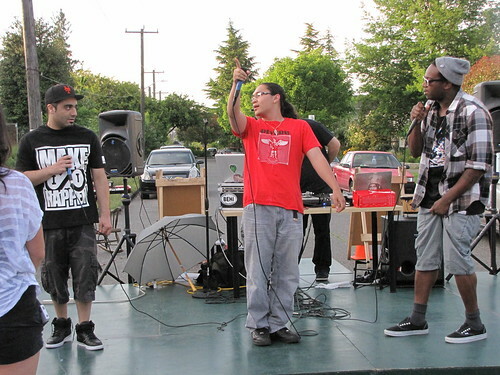 On Sunday, the action moves north, closer to the junction of Beacon and 15th, with a hip hop extravaganza presented outside The Station coffee shop from 4-9 p.m. (Stay tuned for the lineup as it is finalized.) From 6-9 p.m., the Greg Ruby Trio will play at Travelers Thali House, and from 7-9, Atasha Manila will be at Inay’s. There will be other activities as well. Watch this space for more details. 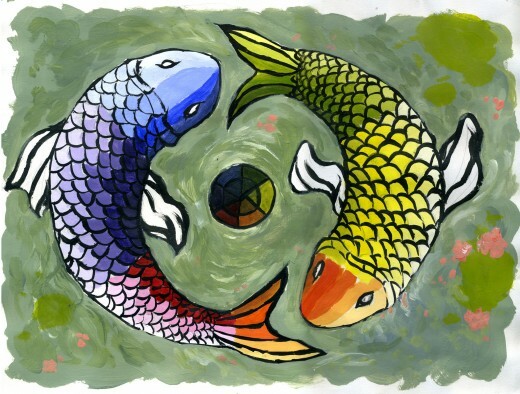 Painting by Franklin student Aren Roberson, courtesy of Franklin PTSA. Just down the hill, the annual Franklin Arts Festival returns this Saturday from 11 a.m. to 3 p.m. at Franklin High School, 3013 Mount Baker Blvd. The festival will feature student performances including the steel drum band, kung fu team, jazz band, Quaker band, and lion dancers, along with displays of visual art, ceramics, and wood arts. 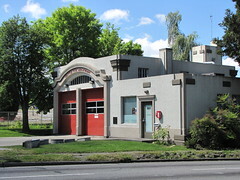 Franklin High School is celebrating its centennial this year; it opened in September 1912 as the second purpose-built high school in Seattle. Student clubs will sell a variety of items including heirloom tomato and vegetable plants, woodcrafts, notecards featuring student art, and original ceramic “Quaker cups” hand-thrown and fired by Franklin alum and artist Francis Roque and glazed by Franklin students. Refreshments will also be for sale. The festival raises funds to benefit Franklin’s art, drama, and music programs and student clubs. Not sure yet what to do this weekend? Join the celebration as El Centro de la Raza hosts their 7th Annual Cinco de Mayo festival on Saturday (tomorrow! 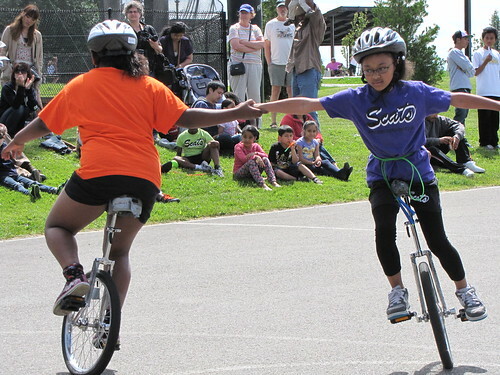 ), May 5, from 1-5 p.m. at El Centro, 2524 16th Ave. S. Admission is free and the whole family is welcome. There will be music, children’s activities, prizes, and craft and informational booths. There will also be traditional Mexican food for sale. 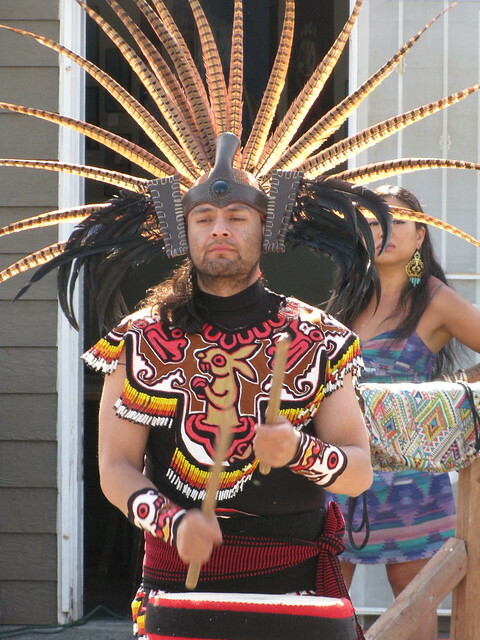 Performances will feature Ameyaltonal Danza Azteca, Ofelia Alanis-Torres, Seattle Fandango Project, Mariachi Seattle Azteca and a desfile cultural (cultural parade). 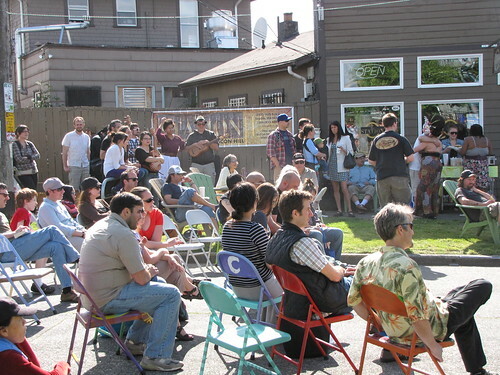 The Seattle Fandango Project will be performing at Cinco de Mayo. Here they are at last summer's Beacon Rocks!. Photo by Wendi Dunlap. El Centro de la Raza brings their 7th Annual Cinco de Mayo Celebration to Beacon Hill on Saturday, May 5, from 1-5 p.m. at El Centro, 2524 16th Ave. S. Admission is free and the whole family is welcome. There will be music, children’s activities, prizes, and craft and informational booths. There will also be traditional Mexican food for sale. 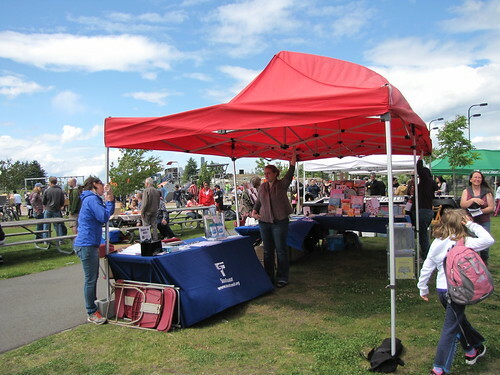 If you are interested in having a booth at the event, email cultura@elcentrodelaraza.org or call 206-957-4630.